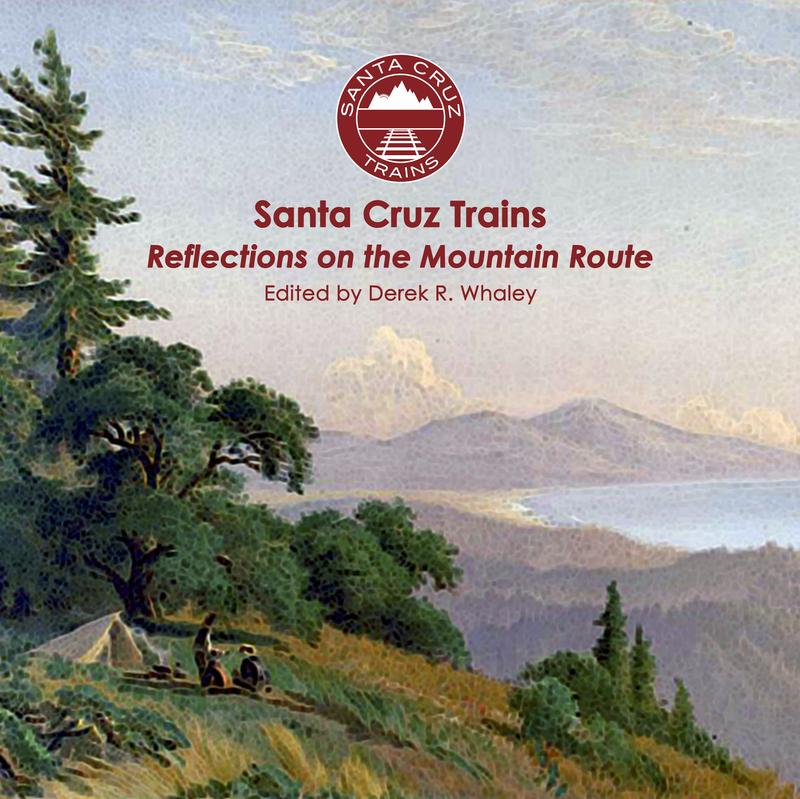 The end of the line for both the San Juan Pacific Railway and the California Central Railroad was at San Juan Junction, 7.8 miles south of the Southern Pacific Railroad track at Chittenden. San Juan Junction was a rather fanciful name that referred to the junction with the narrow-gauged San Juan Southern Railway, which was supposed to travel an additional thirteen miles down San Juan Canyon but, due to economic problems, only ran three miles and never was used. 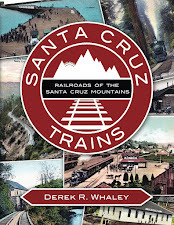 The California Central kept the name, however, because they did succeed in building and using four miles of that line narrow-gauged line, continuing construction of it all the way to 1929, the last full year the railroad operated. But there was no transfer yard at San Juan Junction. Instead, there was a moderately-sized Portland cement plant installed at the site. Unassembled parts stored at the San Juan Portland Cement site awaiting construction, 1908. Construction on the San Juan Portland Cement Company refinery and kilns began in August 1907, immediately after the San Juan Pacific was opened for through traffic. 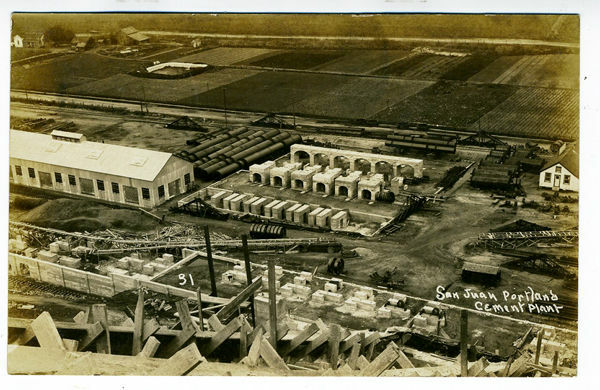 Within days of completion of the railroad, carloads of machinery for the refinery were brought in and dumped beside the tracks at San Juan Junction. The track was extended an additional 0.3 miles to a gravel site south of the Junction and the material there was used for ballast along the line. 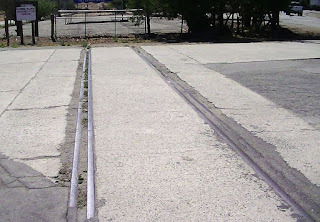 At the Junction, a parallel spur was installed opposite the cement plant so that, when the plant was built, it would be straddled by tracks on either side for maximum efficiency. By September, all the machinery was in place, but nothing had been installed yet. Work had already begun on the San Juan Southern Railway right-of-way, with three miles of track placed by October. And then panic struck the stock market and all work on the cement plant and the railroad was halted. Unfortunately, most of the company's stock value plummeted since it was bound to the Ocean Shore Railroad scheme and the San Juan Pacific began its free-fall. 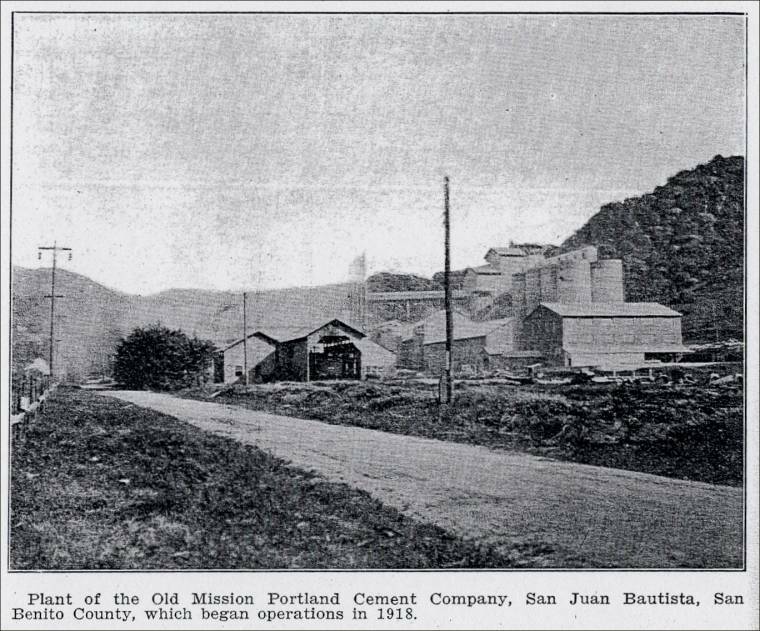 The San Juan Portland Cement Company went bust before it had even warmed up the kilns. 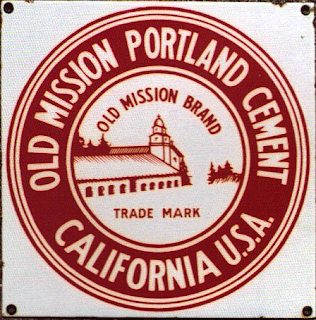 Old Mission Portland Cement Company corporate logo. In January 1912, the Old Mission Portland Cement Company took over operations of both the refinery and the railroad, the latter being rebranded the California Central. For five years, the Old Mission Route was rebuilt with higher-quality materials. Meanwhile, loads of new construction equipment was shipped to San Juan Junction so that the new company could build the long-awaited refinery. San Juan Junction became a true junction at this point. The single standard-gauge locomotive shared space with the company's narrow-gauged unit in the engine house, and the same crews operated and maintained both locomotives on the site. 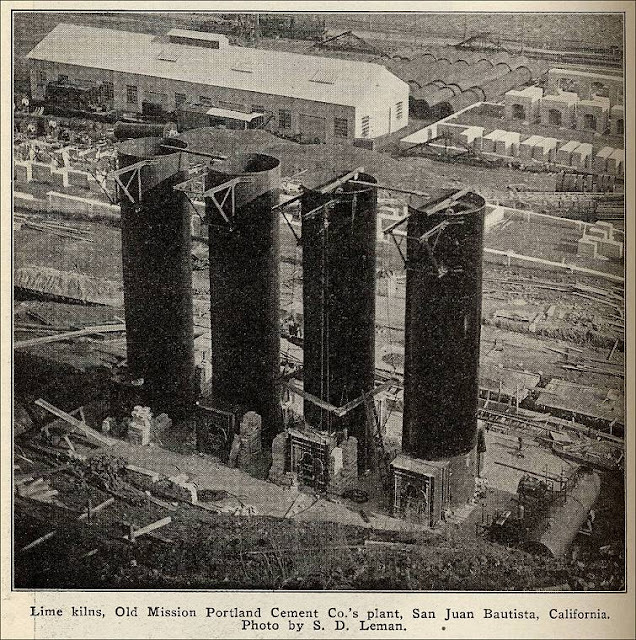 The cement plant thrived for much of the period from 1918 to 1929. In 1927, the organization was merged with the Pacific Portland Cement Company. But the Great Depression made quick work of the entire operation. Broke and without customers, the cement plant and the railroad closed shop. The refinery was gated and abandoned, its pair of locomotives – one narrow-gauged, one standard – left to rot in the engine house. In 1937, the standard-gauged engine had one last run on the old, weed-infested line, but that was simply to ship it out of the county where it operated in Gerlach, Nevada, for its owner, the Pacific Portland Cement Company. The tracks were pulled in early 1938 and San Juan Junction became little more than a dream of a bygone era. The cement plant had a second life, however. Reopened in 1941 due to war demands, the renewed cement plant continued to operate using trucks into the 1970s. It finally closed because the owners were unable to meet new California state air pollution control requirements. The site was eventually stripped of all of its machinery and has since returned to its original owners who use it as a cattle pasture. San Juan Junction was at mile marker 0.0 on the San Juan Pacific Railway line. As with the rest of the route, passenger service was offered at the station three times daily for the first year that it operated, after which all passenger service ceased. All service stopped by June 1909. Limited freight service for the purpose of building the refinery resumed to San Juan Junction around 1914, and then formally reopened in 1916. From this point, irregular freight service from San Juan Junction continued until the refinery closed in 1930. The engine house (and presumably a turntable) was maintained at San Juan Junction until the tracks were pulled in early 1938.
into San Juan Canyon Road at The Alameda. The site of San Juan Junction and the cement plant are unfortunately not accessible to the public. Heading southbound on The Alameda out of San Juan Bautista, continue on San Juan Canyon Road (G1). 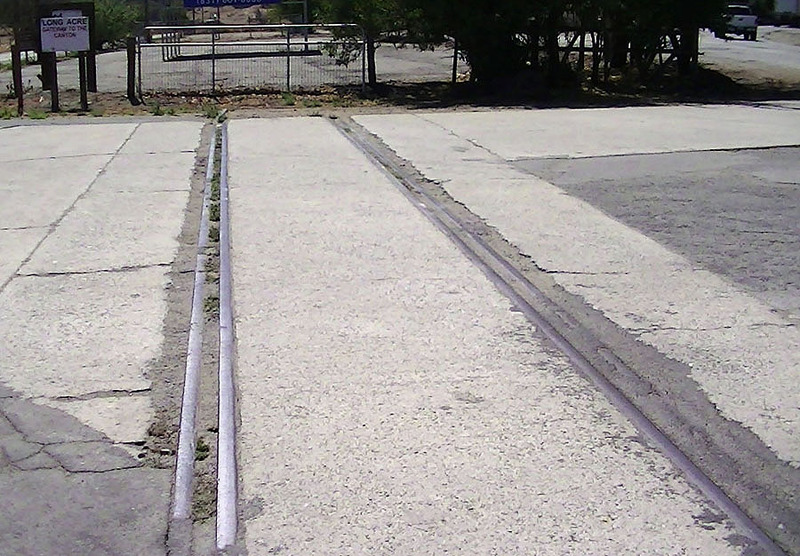 At that intersection, tracks are still imbedded in the center of the road, the last vestige of the original San Juan Pacific and California Central tracks, which was not removed for convenience's sake. For the next 0.4 miles, the old right-of-way is on the west side of the road in what is now reclaimed pastureland. As the road turns slightly to the east, the road to the cement plant and San Juan Junction appears. The site of the old depot is now a paddock of some kind immediately beside the road, leaving little evidence of the original structure behind. The cement plant itself is barricaded and the land is used for grazing cattle. Google Maps shows that the site of the cement plant remains visible, albeit heavily overgrown. The old narrow-gauge right-of-way continues to the south out of the facility. Clough, Charles W., and Bobbye Sisk Temple. San Juan Bautista: The Town, the Mission & the Park. Quill Driver Books, 1996. Perazzo, Peggy B. "Stone Quarries and Beyond". Pre-captioned images above.